After having some ridiculously good gyros from Messini Authentic Gyros at Taste of the Danforth, my wife Michelle and I decided to pay the restaurant a visit. With all the booths and tents lining the street during the festival, it can be hard to see what a lot of the storefronts normally look like, not to mention the shops’ interiors. Messini Authentic Gyros, or Messini for short, turned out to be a lot larger and busier than I expected. We went craving their gyros, but I was also curious to try some other things from their menu. If their gyros are that good, surely they must have other killer things on their menu too, no? 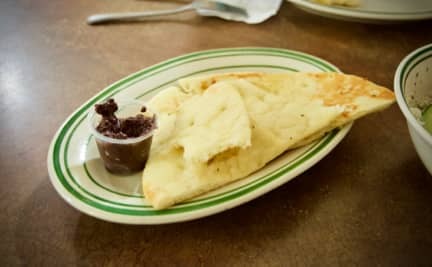 I always like restaurants that serve fresh bread and butter before your meal, but I wasn’t expecting anything like that at Messini, so I was pleasantly surprised when some complimentary warm pita came to our table with a side of kalamata olive tapenade. Very tasty! The Greek Salad (tomato, feta cheese, green peppers, onions, cucumber, olive oil, oregano and kalamata olives — $7.00) was undoubtedly made with very fresh ingredients, but unfortunately only the bare minimum amount of effort was put into cutting all the vegetables into very large, inconsistently shaped chunks. If “rustic” or “homestyle” was what they were aiming for, it didn’t come across that way — it came across as lazy and carelessly slapped together. The dressing had a good flavour and wasn’t overly acidic, but unfortunately there wasn’t much of it. The Pork Souvlaki and Chicken Souvlaki sticks (grilled on a skewer and served with tzatziki — $3.75 each) were both overcooked to the point of being unpleasantly bone dry and as a result were impossible to remove from the skewers without making a big mess. I had to slather them in tzatziki (for moisture) in order to be able to swallow, but they don’t hold back at all on the amount of garlic in their tzatziki, so days later I still had the aftertaste of garlic lingering in my mouth. These were not good souvlaki by any measure. By this point, it was clear that their gyros are the thing to go to Messini for. It is in their name, after all. Marinos Dafnas was born in Greece and came to Canada in 1992. He launched Messini as a sit-down restaurant with table service in 2003, using a gyro recipe his restaurateur uncle created in 1969. He saw an opportunity for such a spot after checking out the Danforth where everyone was serving souvlaki — but no one was serving real gyros. Our trick was to put French fries in these marvellous creations, a recipe from back home that dates back at least 30 years. A gyro is a Greek pita sandwich. In Greece, it’s typically made with pork but when we came to Canada we added lamb or chicken to our menu to give additional options. The pita is generally stuffed with hand-cut meat, chopped tomatoes, mild white raw onions and a yoghurty-garlic tzatziki sauce. Don’t forget an added bonus is fries in your gyro. The Chicken Gryos Pita and Lamb/Beef Gyros Pita (meat shaved from the spit and served in a pita topped with onions, tomatoes, tzatziki and french fries — $6.50/$8.00) were just as fresh and mouthwateringly delicious as the ones we had at the Taste of the Danforth the previous week. The fries certainly make these gyros stand apart, but they also make them deceptively filling. These gyros are a complete meal unto themselves, you really don’t need anything else. All the ingredients work very well together and they have just the right amount of tzatziki to bring everything together. So good! I had the pork gyro during the Taste of the Danforth festival, so I ordered the lamb/beef gyro in order to try something different. All three are good, but I’ll definitely get the pork gyro when I go back next time. It’s unfortunate that their souvlaki skewers and Greek salad were such big fails, but the gyros were good enough to make up for it. Now we know — their gyros are the thing to get at Messini Authentic Gyros. It’s in their name! 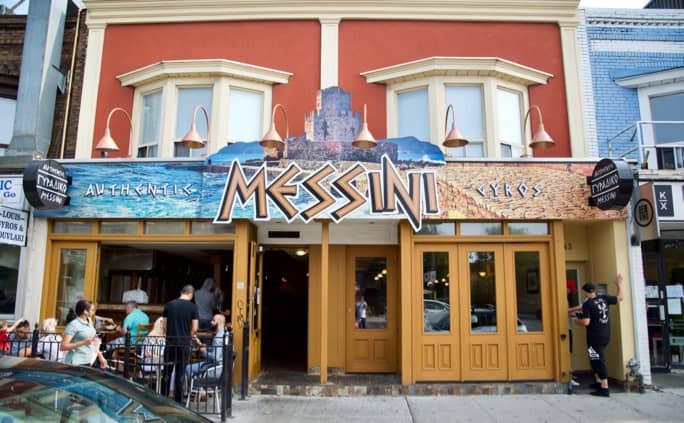 Messini Authentic Gyros was published by Daniel Menjívar on August 25, 2018 at 5:47:29 PM EDT and last updated on April 18, 2019 at 4:41:30 PM UTC .